Biologists, Business Execs and Everything in Between The Biotechnology Program, where are they now? Biotechnology student Michelle Biederman working in the lab. The biotechnology industry has been rapidly growing over the past several years. Technological advancements have propelled the industry forward as scientists continue to develop products and technologies to fight diseases, improve agriculture, produce biofuels, improve manufacturing practices, and sustain the environment. As this industry continues to grow, it is in need of skillful and knowledgeable scientists to bring new and innovative ideas to the table. American University has been producing just that. 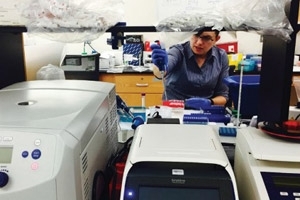 The Professional Science Master's program in Biotechnology at American University provides students with a unique opportunity to acquire biotechnology skills along with knowledge in business, finance, entrepreneurship, and management. This interdisciplinary program prepares graduates for doctoral and medical degrees, careers in government and private industry, and even to become biotechnology entrepreneurs. While in the program, students are able to apply scientific and business theory through internships or hands on research. This ensures that graduates are prepared to enter the workforce even if they do not wish to pursue further education. So what are PSM Biotechnology graduates doing now? The various paths that graduates take are proof of the success of the interdisciplinary and integrative approach of the program. Graduates have gone on to pursue PhDs, have entered private industry, and have even started their own businesses. AU's program and location provide students with the necessary resources to pursue any biotech path that they desire. Megan Nelson, a recent graduate of the program, utilized the AU Incubator, created by the Kogod School of Business, to launch her startup business, MicroInvestigate LLC. MicroInvestigate provides convenient diagnosis stations that will be used by college students and parents to diagnose common illnesses within one hour without the need for a doctor's visit. She developed her business idea in the Biotechnology course (Bio 489/689) offered to graduate and undergraduate students. Nelson became very passionate about her business idea and thus joined the AU Incubator. From there, she joined the National Science Foundation (NSF) I-CORPS Regional Program, which helps prepare scientists through entrepreneurship training to further develop their ventures. This grueling program pushes scientific entrepreneurs to reach the next level, that next level being National I-CORPS Program. Nelson was successfully accepted to this highly competitive program and is now continuing the development of MicroInvestigate by traveling to conferences, interviewing customers, and applying for seed money. In addition to providing students with resources to create their own startups, AU's PSM Biotechnology program also prepares students to continue their higher education by pursuing PhDs or by entering medical school. Pragati Chengappa and Ayman Abunimer are two of these graduates. Ayman Abunimer graduated in 2014 and is currently a medical student at Virginia Tech Carilion School of Medicine and Research Institute in Roanoke, Va. Pragati Chengappa graduated just this past year in 2016, and is now a Biological Sciences PhD student at Drexel University in Philadelphia, PA. In reflecting on her experience she explained, "I have greatly benefitted from the Biotechnology program at AU because it helped me to hone my independent research skills and also gave me a strong theoretical foundation". In addition to preparing students to enter PhD and MD schools, the Biotechnology program has also prepared graduates for private industry. Grace Uttarotai, who graduated in 2016, is a great example of a former student who is utilizing the integrative aspect of AU's program in her career. She is currently the Senior Scientist of Biochemistry R&D as well as the Lead Administrative Executive at Chemily LLC in Atlanta, Ga. She is involved in glycosyltransferase production and development. Uttarotai said, "American University's biotechnology program has given me the confidence and intelligence to be a leader in my workforce." She intends to eventually pursue further education. Cansu Dernek is also another PSM Biotechnology graduate who chose the private industry route. Dernek graduated in December of 2016 and is currently an Associate Scientist at WuXi AppTec in New Jersey. WuXi AppTec is a leading open-access R&D capability and technology platform company that serves the pharmaceutical, biotechnology, and medical device industries with the goal of shortening the cycle and lowering the cost of drug and medical device R&D through cost-effective and efficient solutions. Dernek appreciated her time at AU and said, "The PSM Biotech program not only consists of science and technology courses, but also develops professional skills by offering business and management classes." She plans to use that business knowledge to step forward into management positions in the future. As American University's PSM Biotech Program continues to grow, it will be exciting to see where this program takes future graduates. Whether it be through research, education, policy, or entrepreneurship, AU students will continue to be successful.